The last issue of Danny Fingeroth's fill-in run between the Denny O'Neil and Michelinie/Layton runs is also a set-up for a limited series for the new Spider-Woman that never manifested. Even though the series never happened, this issue does introduce a number of elements for Spider-Woman, including her ex-husband Larry and their daughter Rachel. But it begins with an angry video call to the West Coast Avengers from Valerie Cooper, who intimates that the Avengers may be harboring Spider-Woman after she helped the Avengers escape from the Vault after they were arrested by Freedom Force. 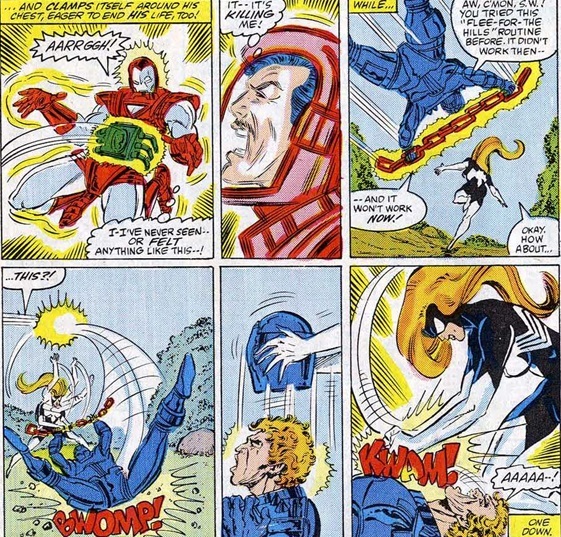 Even though the Avengers were exonerated, Spider-Woman's actions still constitute a betrayal. 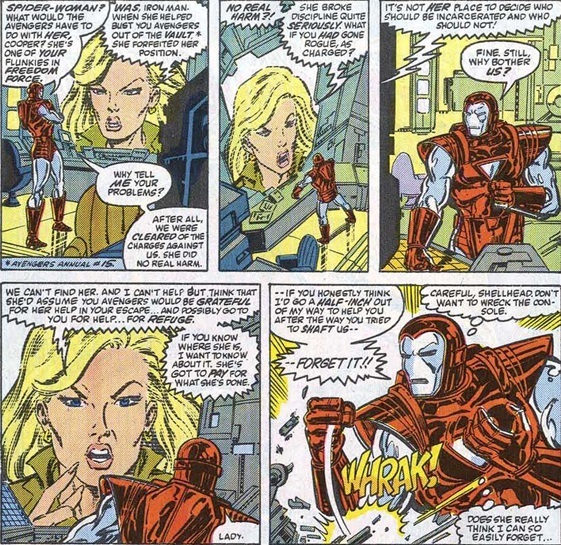 Even though the Avengers don't have Spider-Woman, Cooper makes the point that it would be better for her if Iron Man found her and convinced her to turn herself in. It would be better than if, say, the teammates she betrayed in Freedom Force found her, and voluntarily turning herself in would look better on her record. Plus, there's now a reward out for her return, which might attract the attention of dangerous bounty hunters, which is indeed the case. The bounty hunters in question are former AIM agents that have decided to go freelance. 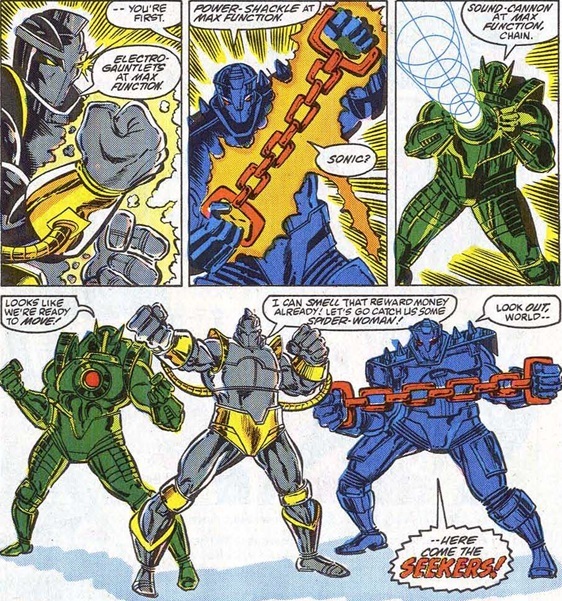 They call themselves the Seekers (individually Chain, Grasp, and Sonic). 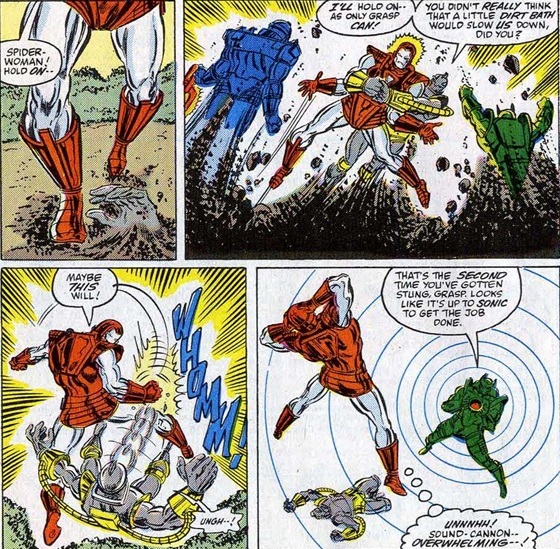 After conferring with Hawkeye, Iron Man decides to go after Spider-Woman, and by tracing an energy signature left behind by her psionic web, he finds her before the Seekers. And she somehow manages to convince Iron Man to help her kidnap her daughter and help the two of them go underground (someone might want to check if she has mind-influencing pheromones like the original Spider-Woman). But once he's out of her presence, he realizes that's probably a dumb idea and returns in time to help her fight off the Seekers. ...she does turn herself in. And Valerie Cooper tells her that she's no longer going to work with Freedom Force. Instead, the world will continue to believe she's a fugitive while she secretly works as an undercover operative. Her handler is a man named Mike Clemson, who secretly wants vengeance from her for undisclosed reasons. For a fill-in run, Fingeroth's issues were surprisingly good. I especially liked his Spymaster/Happy Hogan story, and this issue benefits from the development he must have planned for Spider-Woman's mini-series (which i hear would have been a ripsnorter). Fingeroth will next write Spider-Woman in a pair of Spectacular Spider-Man issues. Historical Significance Rating: 3 - first Seekers (Chain, Grasp, and Sonic). First Mike Clemson. First Larry and Rachel Carpenter. 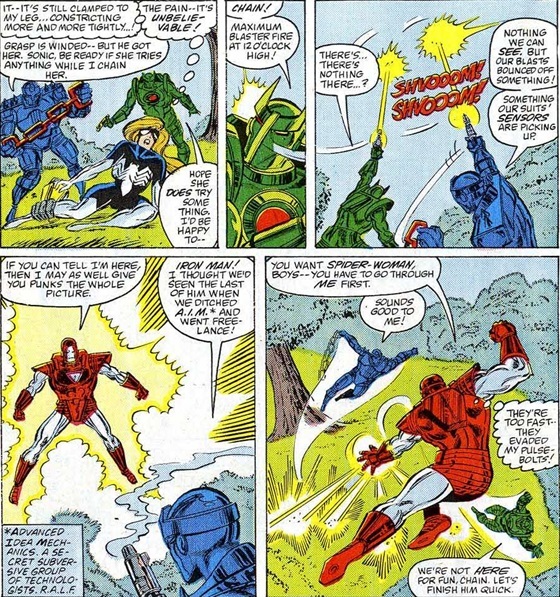 Chronological Placement Considerations: The MCP make this Iron Man's first appearance after West Coast Avengers annual #1, which pushes this back a bit in publication time before his West Coast Avengers appearances. There's nothing in this issue that forces that placement, but it works fine and i guess it makes sense that Val Cooper would be contacting the Avengers pretty soon after her betrayal in the annuals, so i am following their lead here. 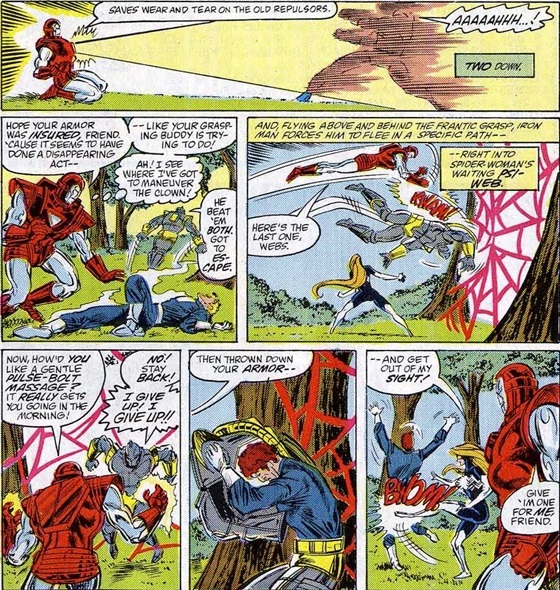 Spider-Woman was part of Freedom Force when they captured the Avengers in Avengers #15 but she subsequently had second thoughts and freed the team, letting them hunt down Quicksilver and clear their names in West Coast Avengers annual #1. 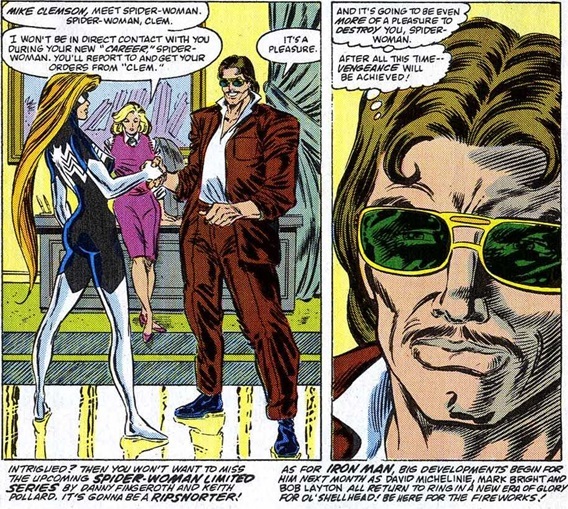 The reason why this issue takes place before Avengers 273 is because Julia appears in a flashback in Spectacular Spider-Man 125 that takes place after this issue but before the Mansion Siege. The Spider-Woman mini series did eventually come out, years later. But it was a different mini-series- it wasn't by Fingergoth and it took place after she join the AWC. But it did delve into the history of Mike Clemson's hatred for Spider-Woman. Has anyone ever made a list of all the dropped and/or delayed mini-series Marvel had in the late 80's? It made all of Marvel look like Chris Claremont with their constantly dropped sub-plots. And does anyone know why there were so many? We have Spider-Woman, Nick Fury vs SHIELD, Fallen Angels (way delayed) and at least a couple starring various X-Men. The ironic thing, about Spider-Woman saying goodbye to Rachel is that Julia DOES fell like she "has a right to take her" about ten years after this story. She'll also have a completely different opinion about surrendering to the government. One thing I don't get is why DIDN'T Val simply send Freedom Force against Spider-Woman? I thought missions like this was the whole point of having super-powered goverment operatives: so the Coopers and Gyrichs of the world wouldn't have to beg the Avengers for help.